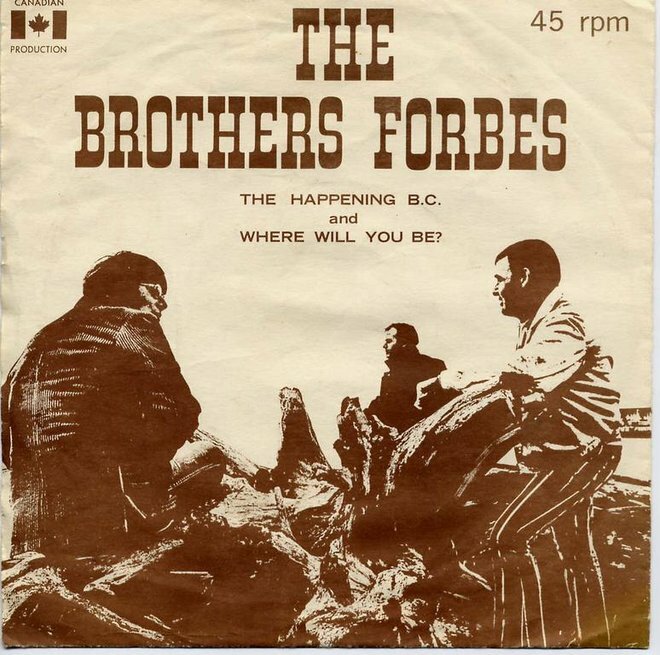 Prior to 1968, "The Brothers Forbes", John and Larrie had a very productive career in the Royal Canadian Navy as musicians in the Naden Band, stationed in Esquimalt. They were also performing in separate groups playing dance music. Larrie played drums,trumpet and vocals with "The Classics" along with Gabby Bruner, George Lovic and Bert Botten. 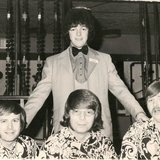 John was playing piano with "The Jays", including Jim Ryan, Fred Wyatt and Terry Totzke. On the classical side, both John and Larrie played for many years in the Victoria Symphony Orchestra. 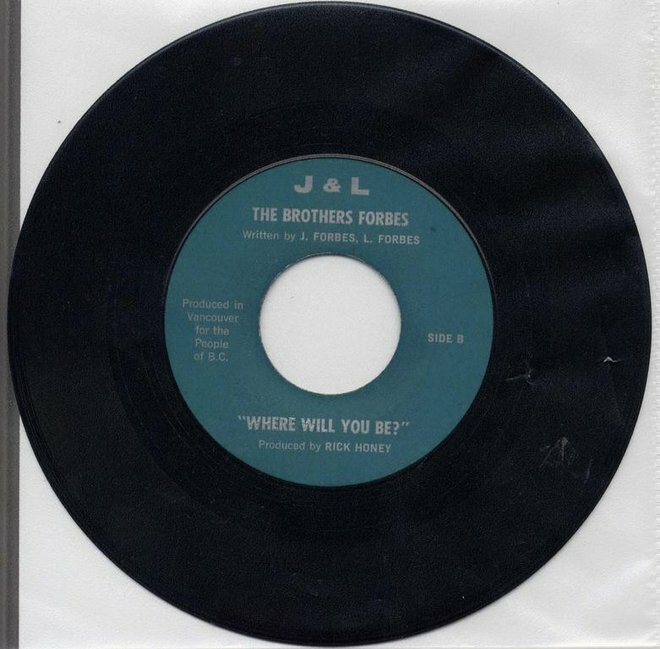 In the early spring of 1968, John and Larrie decided to put their talents together and called themselves "The Brothers Forbes". They put their show together rehearsing in Johns' garage before venturing out to play "casual gigs". Larrie played drums, flute, trumpet, trombone and vocals. Brother John playing piano, organ trumpet, trombone and harmonizing. 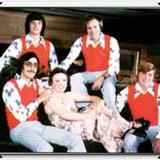 In May of 1968, the boys were approached by Clare Anderson, owner of the Oak Bay Marina Restaurant. Their regular organist, Bevan Gorelangton was taking four months off, and they needed a replacement act. 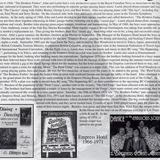 Thus giving the brothers their first "steady gig", launching what was to be, a long and successful career in Victoria. After a great summer, the Brothers finished at the Marina in September. 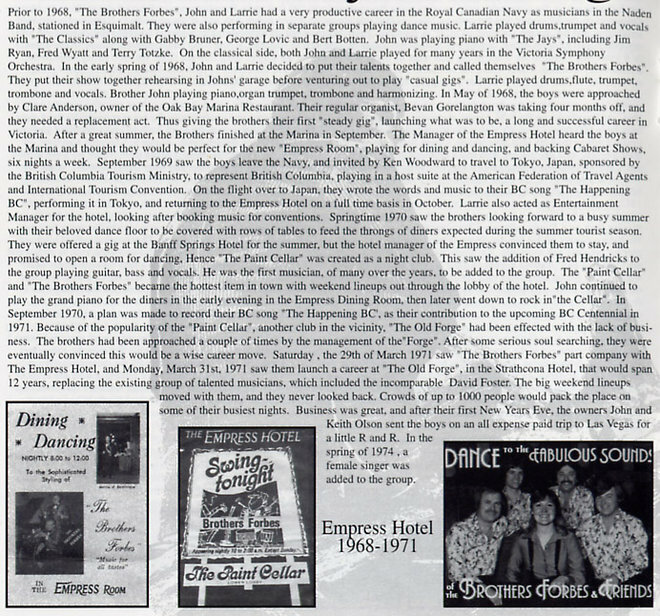 The Manager of the Empress Hotel heard the boys at the Marina and thought they would be perfect for the new "Empress Room", playing for dining and dancing, and backing Cabaret Shows, six nights a week. 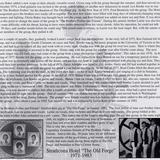 September 1969 saw the boys leave the Navy, and invited by Ken Woodward to travel to Tokyo, Japan, sponsored by the British Columbia Tourism Ministry, to represent British Columbia, playing in a host suite at the American Federation of Travel Agents and International Tourism Convention. On the flight over to Japan, they wrote the words and music to their BC song "The Happening BC", performing it in Tokyo, and returning to the Empress Hotel on a full time basis in October. Larrie also acted as Entertainment Manager for the hotel, looking after booking music for conventions. Springtime 1970 saw the brothers looking forward to a busy summer with their beloved dance floor to be covered with rows of tables to feed the throngs of diners expected during the summer tourist season. They were offered a gig at the Banff Springs Hotel for the summer, but the hotel manager of the Empress convinced them to stay, and promised to open a room for dancing, Hence "The Paint Cellar" was created as a night club. This saw the addition of Fred Hendricks to the group playing guitar, bass and vocals. He was the first musician, of many over the years, to be added to the group. The "Paint Cellar" and "The Brothers Forbes" became the hottest item in town with weekend lineups out through the lobby of the hotel. John continued to play the grand piano for the diners in the early evening in the Empress Dining Room, then later went down to rock in"the Cellar". 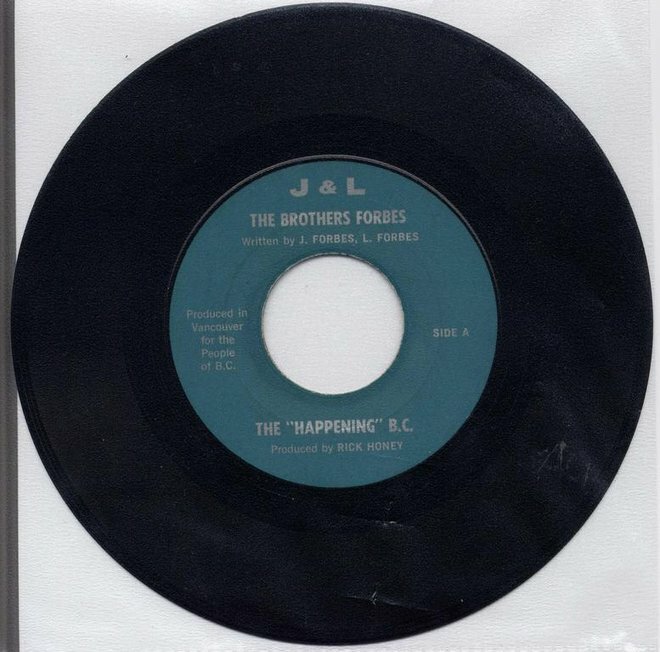 In September 1970, a plan was made to record their BC song "The Happening BC', as their contribution to the upcoming BC Centennial in 1971. 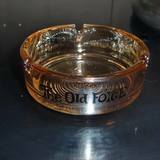 Because of the popularity of the "Paint Cellar", another club in the vicinity, "The Old Forge" had been effected with the lack of business. 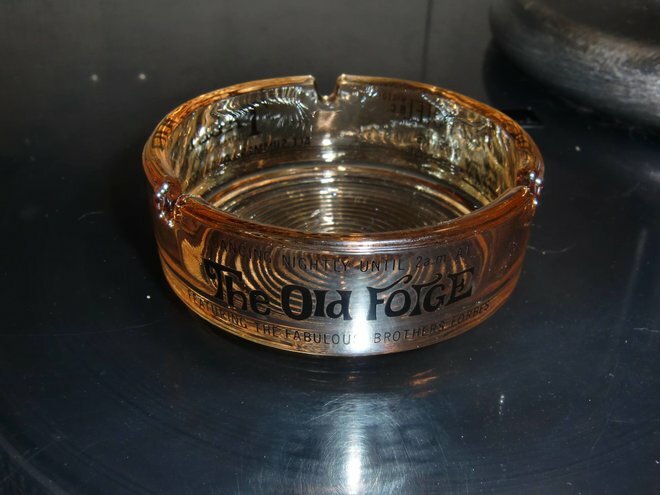 The brothers had been approached a couple of times by the management of the"Forge". After some serious soul searching, they were eventually convinced this would be a wise career move. 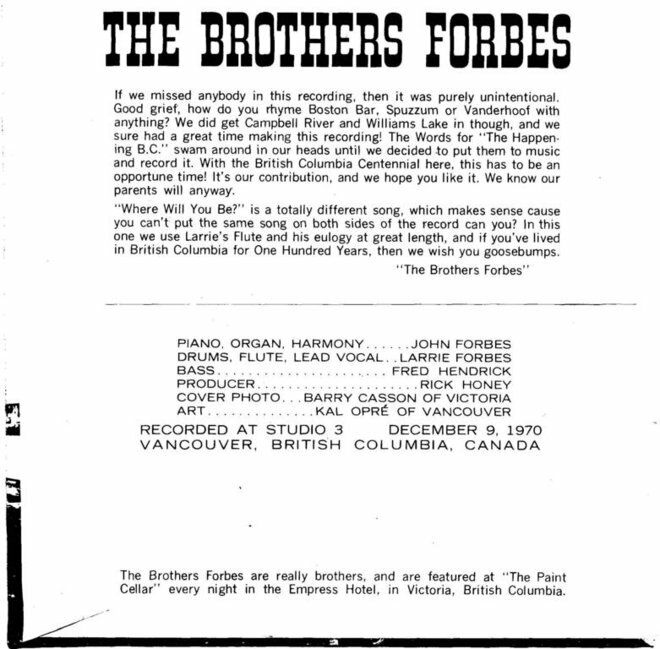 Saturday , the 29th of March 1971 saw "The Brothers Forbes" part company with The Empress Hotel, and Monday, March 31st, 1971 saw them launch a career at "The Old Forge", in the Strathcona Hotel, that would span 12 years, replacing the existing group of talented musicians. The big weekend lineups moved with them, and they never looked back. Crowds of up to 1000 people would pack the place on some of their busiest nights. 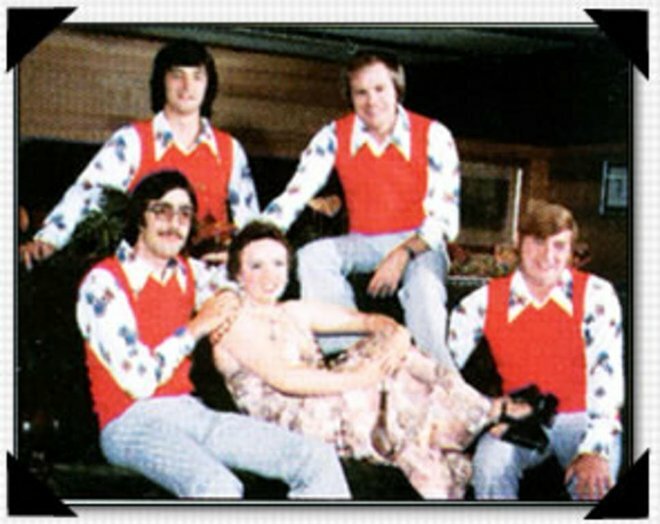 Business was great, and after their first New Years Eve, the owners John and Keith Olson sent the boys on an all expense paid trip to Las Vegas for a little R and R. In the spring of 1974 , a female singer was added to the group. Gloria Baker added a new scope to their already versatile sound. Gloria sang with the group through the summer, and then moved on. In October 1974, a lead guitarist was invited to the group, which added yet another new dimension in sound. 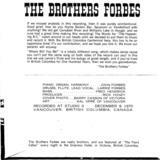 Len Knoke was to stay with"The Brothers Forbes" for the duration of The Old Forge gig. In the New Year of 1975, Fred Hendricks left the group. The Hotel Management gave the brothers two weeks off to regroup. The next few weeks were filled with long days of rehearsals, changing songs, costumes and lighting. Gloria Baker was brought back into the group, and Ken Garland was added on tenor sax and flute. 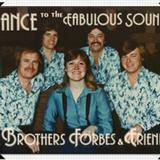 It was decided at this point to change the name of the group to "The Brothers Forbes and Friends". During this period, brother Larrie was also having some difficulty with his throat, having to have some nodes removed from his vocal chords. After his operation, he could not talk for 30 days, and another month before he could sing. This posed some problems, as Larrie was the lead singer. But, with the talents of other members of the group, they pulled it off. After a couple of months, they gradually worked Larrie's songs back into the repertoire. 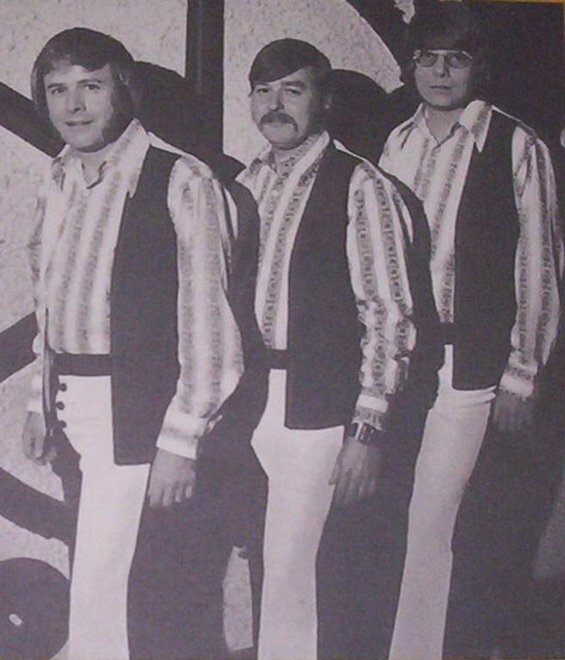 In the early fall of 1975, Ken Garland left the group, and was replaced by Gordie Clements on saxes and flute. Gordie was in the music program at the University of Victoria at the time, and had to go to school all day and work with us every night. Gordie was with the group for over two years. Here is where they started some overlapping of personal in the group. Gloria sang with the group for another year after Gordie came along. The next female singer was Jill Galt, who had come to the group from a large showgroup called "Stratisfaction". This takes us into 1976. 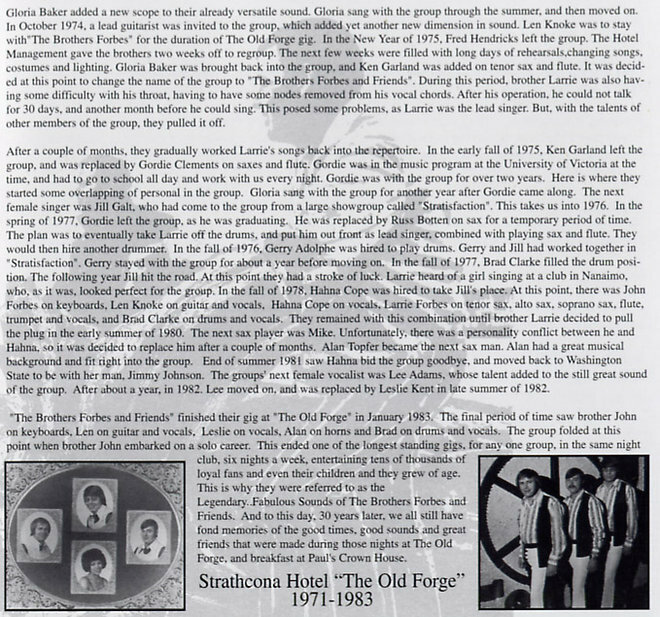 In the spring of 1977, Gordie left the group, as he was graduating. He was replaced by Russ Botten on sax for a temporary period of time. The plan was to eventually take Larrie off the drums, and put him out front as lead singer, combined with playing sax and flute. They would then hire another drummer. 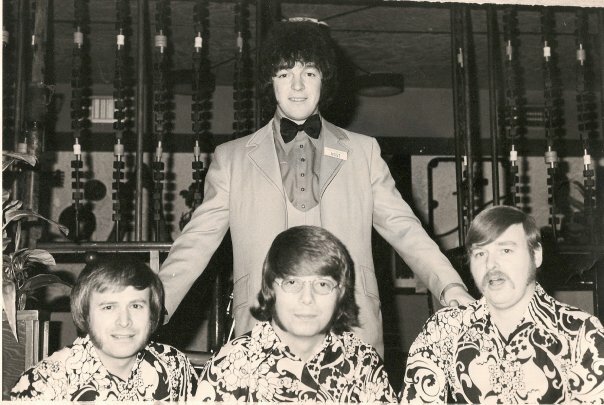 In the fall of 1976, Gerry Adolphe was hired to play drums. Gerry and Jill had worked together in "Stratisfaction". Gerry stayed with the group for about a year before moving on. In the fall of 1977, Brad Clarke filled the drum position. 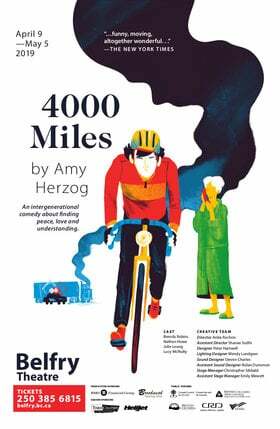 The following year Jill hit the road. At this point they had a stroke of luck. Larrie heard of a girl singing at a club in Nanaimo, who, as it was, looked perfect for the group. In the fall of 1978, Hahna Cope was hired to take Jill's place. At this point, there was John Forbes on keyboards, Len Knoke on guitar and vocals, Hahna Cope on vocals, Larrie Forbes on tenor sax, alto sax, soprano sax, flute, trumpet and vocals, and Brad Clarke on drums and vocals. 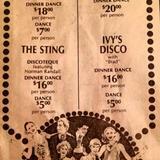 They remained with this combination until brother Larrie decided to pull the plug in the early summer of 1980. The next sax player was Mike. Unfortunately, there was a personality conflict between he and Hahna, so it was decided to replace him after a couple of months. Alan Topfer became the next sax man. Alan had a great musical background and fit right into the group. End of summer 1981 saw Hahna bid the group goodbye, and moved back to Washington State to be with her man, Jimmy Johnson. The groups' next female vocalist was Lee Adams, whose talent added to the still great sound of the group. After about a year, in 1982. Lee moved on, and was replaced by Leslie Kent in late summer of 1982. 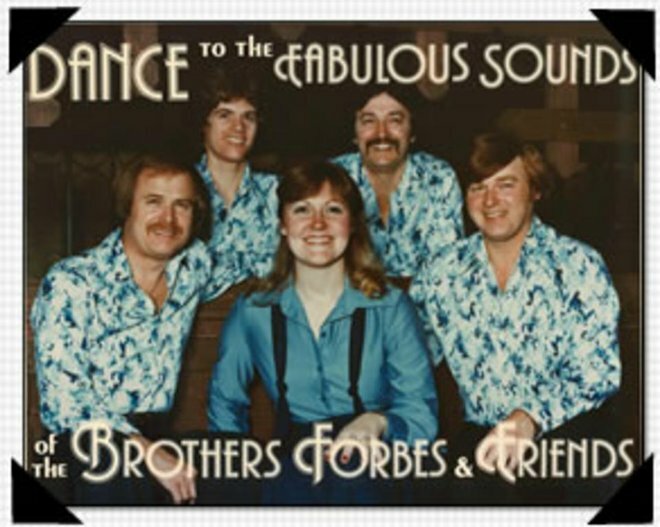 "The Brothers Forbes and Friends" finished their gig at "The Old Forge" in January 1983. 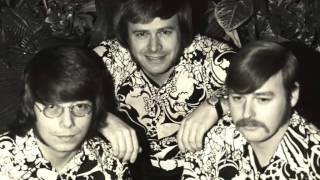 The final period of time saw brother John on keyboards, Len on guitar and vocals, Leslie on vocals, Alan on horns and Brad on drums and vocals. The group folded at this point when brother John embarked on a solo career. 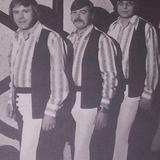 This ended one of the longest standing gigs, for any one group, in the same night club, six nights a week, entertaining tens of thousands of loyal fans and even their children and they grew of age. This is why they were referred to as the Legendary..Fabulous Sounds of The Brothers Forbes and Friends. And to this day, 30 years later, we all still have fond memories of the good times, good sounds and great friends that were made during those nights at The Old Forge, and breakfast at Paul's Crown House.